There are 5 inches of snow on the ground and I just bought a new coffee pot yesterday, our old one from California broke. After being in storage for a year, I'm not surprised. I'm happy, in fact, to get rid of something else from our time on the West Coast. We're different now, simpler. We bought a Mr. Coffee for $21 and it does the job. I'm content with the bare minimum now. There are three dogs on the couch next to me. A girl that lopes in the backyard and barks at scents she finds in the wind. Two boys that sit on our lap, our stomachs, our chests to stay close, stay warm, stay within eyesight and earshot for treats and kisses and words of comfort when the wind blows too strong. It's been two days since we got back from Cancun. A world so apart from where we are now. Five hour naps and three course meals. We talked to no one and turned off our phones for the weekend. We fell in love with the beach, the coati, the people. The language and the lilting way I speak it nervously. A world so different than where we live now; we spoke about how it is not right to build the wall. We spoke about how to be more active in what we can do now, when we got back to our real lives. This week has been full of numbers, questions without answers. Even though I love this cold, sometimes when the snow falls, I dream of warmer weather every once in a while. I dream of more pools and more margaritas. The wild flowers that grow by our creekbed and the dogs lying in the shade. Of barbecues and fair foods. 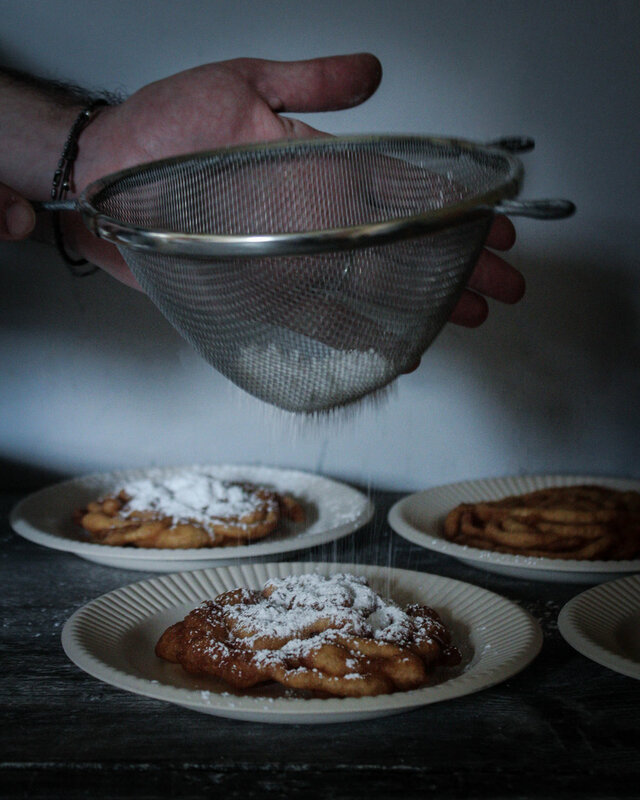 Of ballpark lemonade and fried dough covered in sugar. With the addition of the whipped egg whites and cornstarch, these are lighter versions of your favorite fair food. And you all know how much I love fried dough by now (see here, here, and here)! Cover with confectioner’s sugar and enjoy! !